The news on the financial troubles plaguing the ACA, along with the real-world effects on those people in the individual market continue. Of course, the Republicans are blaming the Democrats, and the Democrats are blaming the Republicans. In reality though, who brought this law into being? Politics aside, the facts are disturbing. Health insurers are pulling out of exchanges, the co-ops that were allowed under the original law continue to tank (only of the 23 remaining). Just recently Evergreen Health Care, a co-op in Maryland has made moves to go private – something that originally was not allowed under the law, but was reconsidered in May after several other co-ops failed. 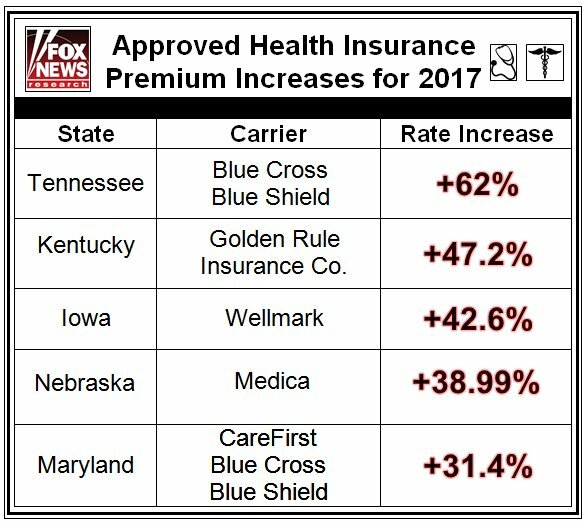 And insurance premiums, as well as deductibles and co-pays are still rising at an alarming rate. Recent articles detail how the Tennessee and Minnesota state exchanges are in serious trouble. 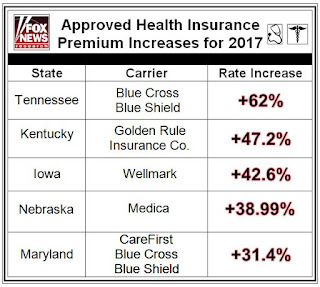 Tennessee’s state insurance commissioner approved premium increases of up to 62% in an effort to save the exchange, saying "I would characterize the exchange market in Tennessee as very near collapse." Minnesota is in similar straits, allowing the health insurers in its marketplace raise rates by at least 50 percent next year, after the individual market in the state came to the brink of collapse, according to the the state’s commerce commissioner. Blue Cross Blue Shield of Minnesota announced it would stop selling health plans to individuals and families in 2017. The company said it was "projecting a total loss of more than $500 million in the individual [health plan] segment over three years." While the employer based health insurance market is still quite stable, the individual insurance market "does not feel stable at all," Janet S. Trautwein, chief executive of the National Association of Health Underwriters, told The New York Times. "In many states, the individual market is in shambles." GOP seeks to block ObamaCare settlements with insurers – citing the issues with the "risk corridors" as one reason insurers are leaving the market. And then there’s this news from HR Policy on a House hearing critical of the exchanges performance. The hearing cited more evidence from the Government Accountability Office about vulnerability of the exchanges to fraud. Every fictitious application using fake documents the GAO submitted was approved. This is also not new, and has been reported repeatedly in the past. While both sides are touting "fixes" ranging from a public option (universal health care) to allowing insurers to sell across state lines to increase competition, to complete repeal, nothing seems to address the whole issue. Recalling the now-famous quote from Nancy Pelosi that "we have to pass the bill so that you can find out what is in it" shows us that not knowing has caused what may have been good intent to become a complete disaster.